A New York City resident dictates her "I Wish to Say" message to UNCG art student Therry Cromratie. 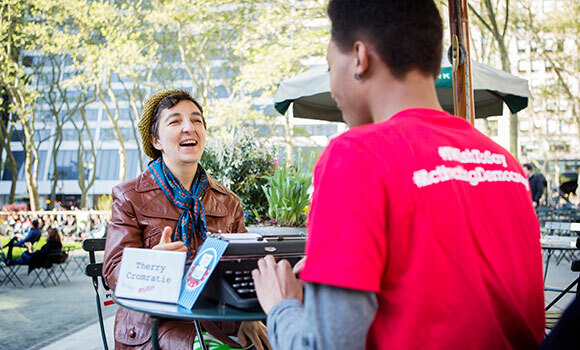 Last week, nearly 60 UNCG students – led by art professor Sheryl Oring – ditched their smartphones for several dozen vintage manual typewriters and spent the afternoon in New York City transcribing messages to the 2016 presidential candidates. The concept of the project, titled “I Wish to Say: 2016,” was simple: UNCG students and other volunteer typists set up shop in Bryant Park while passers-by dictated messages to the candidates in this year’s presidential race. While Oring has been performing the “I Wish to Say” project across the country since 2004, this year’s event – which was part of the PEN World Voices Festival – was particularly memorable because of the student engagement. Students were involved in nearly every aspect of the large-scale public art project, from project management to documentation to implementation. For Oring and her students, the project is all about giving people a voice. The “I Wish to Say” team produced more than 300 letters last Tuesday, all of which will be mailed to the candidates. Additionally, excerpts from letters were read to the public throughout the one-day event. Where is the project’s next stop? Right here in North Carolina. Oring will perform “I Wish to Say” on Nov. 1 at the Southeastern Center for Contemporary Art (SECCA) in Winston-Salem, and is currently planning a fall performance in Greensboro.